"With the ability to be operated with naturally obtained energy, Solar Hybrid AC is the future, " said Akshay Dhoot, Head of Technology and Innovation, Videocon at the product launch. 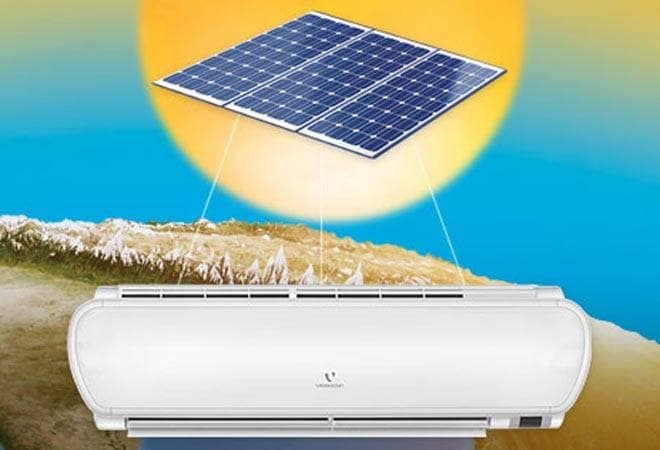 Videocon, the consumer electronics and home appliances company, on Tuesday unveiled a Hybrid Solar Air Conditioner (AC). The company claims it's the world's first AC to run on solar energy. Videocon Hybrid Solar ACs eliminate the need to consume electricity from the grid, allowing 100 per cent power savings and a lower carbon footprint in contrast to the energy guzzling conventional ACs. However, if the battery runs out of charge, it automatically shifts to regular electricity supply. Also, the surplus energy generated via these solar ACs can be exported back to the grid to receive bonus payment as per the government regulations. The company also has plans to make its entire AC portfolio compatible with solar energy, added Dhoot. "Its solar panel comes with 25 years' of linear power output warranty and 10 years of panel warranty. The newly launched AC provides efficient cooling without any fluctuations with the least load on grid," said Sanjeev Bakshi, COO - AC Division, Videocon. With the launch of this eco- friendly AC range, Videocon aims to capture 13 per cent% of the AC market in India by end of FY 2017 from the current 9 per cent, said Bakshi. The AC sector is expected to grow by 25 per cent to 5 million units in 2016/17. The product is available in two models: 1 ton Hybrid Solar AC available for Rs 99,000 and the 1.5 ton model at Rs 1,39,000. Both the models comply with BEE star ratings and possess 5 stars, making them a certified power saver, claims the company statement. The AC comes with R-410A refrigerant and also has features such as digital display, auto restart, turbo cool mode and copper condenser.